A saxophone should be clear about its origin. Note: this article rant is directed at new or inexperienced players who haven’t been around the saxophone scene very long. It is also just like, my opinion, man. They’ve got a link to the website, and they still can’t tell who made the saxophone they are considering purchasing ?- that is a silly situation. And it is not the consumer’s fault! Some (not all!) 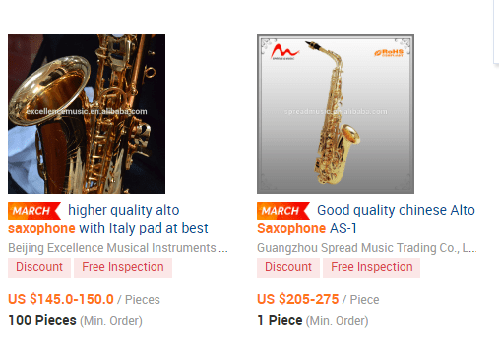 of these instrument sellers are at best reluctant to outright state that they got their saxophone from China, and some even actively obfuscate origin, with photos of the saxophone near workbenches or being subjected to a torch. Here is the deal: No, they were not handmade, unless you mean in China, Taiwan, or Vietnam. And if the seller is not up front about that, avoid them. Click the links. Take a few minutes, look around. This article will wait for you. See all that? That is an enormous amount of specialized knowledge represented there, and an enormous amount of tooling. If you added it all up, you’ve probably got several thousand years of experience and several million dollars of tooling. That enterprise took years to establish, and had to grow naturally. Likely first as a repair business, gradually growing to customization and making parts until eventually a whole instrument appeared, with new instruments being added over the years until a full range of products had been developed- the same way Selmer did it. It didn’t just show up on Facebook one day with a new saxophone. That is- simply put- impossible. Of course, some E. Asian imported horns are of a much higher quality than others. And as of this writing, some retailers do value-add, like for instance the well-built E. Asian sourced horns sold by Tenor Madness, which undergo a considerable amount of setup (basically an overhaul, as I understand it). Or P. Mauriat, which is another well-built Taiwanese brand that has an established dealer network, parts availability, a warranty, etc. (and yes that basic stuff is quite notable in the import saxophone business). Chateau is an often well-made Vietnamese brand whose star is rising; I actually visited the factory in 2008. And of course there are others. And I don’t even have a problem with the idea of relatively cheap imported horn that doesn’t have a ton of value-add in it, as long as it is priced commensurate with its value and its origin is clear so the consumer knows what they are buying. There is definitely a space in the market for a cheap horn that lasts a few years and can be bought new without any hassle- with the understanding that it in fact is a cheap horn, that it actually doesn’t cost much, that the quality of the build is not the best, and that it is compared to a truly professional quality instrument essentially a throwaway item (although if you are searching for a cheap good student sax, I recommend a used Yamaha YAS or YTS 23 and taking to a reputable repairer to get it fixed up if it needs it). But that isn’t how a large segment of the market currently operates. There are a ton of “custom” and “premium” and what-have-you saxophones with premium prices and claims to professional quality that just aren’t professional quality instruments. And not only is this wrong on the face of it- as in it is morally wrong to exploit a gap in consumer knowledge for profit- but it is long-term damaging to the saxophone world. What kid starting out is going to get a second chance when his parents blow $2500 on a saxophone with a wholesale price of $250 that fails after a couple years and is not easily repairable? How comfortable will they feel buying another saxophone- ever? As seems to be a near-universal human failure, short-term profits come at the expense of the long-term big picture. So if you are going to buy a saxophone that is handmade in wherever, ask them to prove it.